I contend that Barack Obama was the dumbest president in our history. I know Democrats publicly disagree. However, I suspect that privately they agree with me, wholeheartedly. How could you possibly believe a man to be the political Messiah who lost over 1,000 seats to the “competition” during his tenure? That’s insane. And the fact that Democrats now ask Obama to campaign for them is all the evidence you need of their desperation. Barry “The Clown” Obama dared Donald Trump to save Carrier. Trump saved Carrier–without the use of a magic wand, I hasten to add. Trump torches Obama’s domestic policy, setting records in all areas of the REAL recovery. Unemployment can’t go any lower, and for every categorical “box” of people Democrats like to tout. Blacks, Hispanics, women, all enjoying record employment. More people working than in American history. Great jobs returning to America, something Obama said with his own moronic mouth couldn’t happen. Trump established GDP numbers Obama said weren’t possible, then embarrassed himself by trying to take credit for Trump’s moves. That’s just the tip of the iceberg on domestic policy. Trump got NATO to pay its bills and put all countries on notice that America will no longer be the whipping boy on trade. Trump’s policies returned more money to the people and to those who generate America’s wealth. Moreover, to call his foreign policy “genius” understates it. Trump uses America’s economy like a war machine. And he wins on every front. In a few days, Iran will feel the wrath of Trump like they’ve never felt before. Trump will accomplish in two years what the world failed to accomplish in almost 5 decades. Because of Trump, the Korean peninsula, Asia, and frankly the world is more safe. The Middle East is more safe, and ISIS has been beaten into submission. 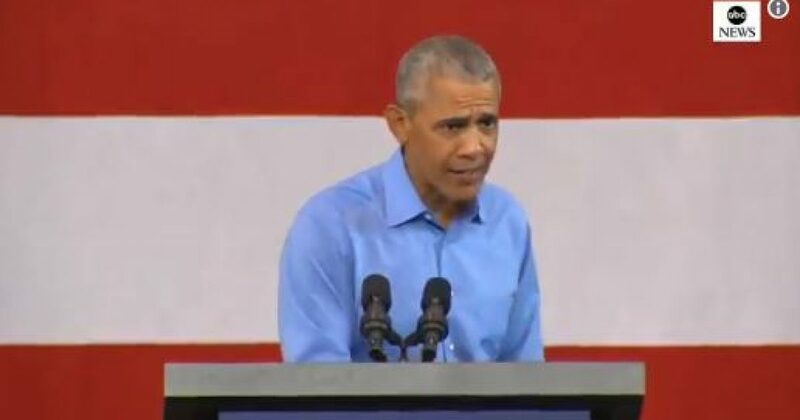 Yet in this video, feckless Obama mocks Democrat voters he believes to be beguiled with President Trump. Obama practically cut Trump 2020 campaign commercials! That that’s that’s the thing, that’s the most important thing in this election. Not healthcare, not…not uh…you know, whether or not that folks are able to retire. Not not, you know, doing something about higher wages or…rebuilding our roads and bridges and putting people back to work. Suddenly it’s this group of folks, we don’t even know where they are, they are way down there. That’s the biggest thing. And you know, as soon as the election is over, everybody will be like, what happened. We were being invaded; where did it go? They do it every time, and too often it works. Eh…everybody gets all freaked out. We gotta stop falling for this stuff. We’re like Charlie Brown with the football. You can’t fall for that okey-doke. Don’t be hoodwinked, don’t be bamboozled. Wisconsin, don’t fall for that kind of fear-mongering. Ironically, everything Obama described has been address by President Trump. Americans are finally at a place where we can focus our energies on what matters, because all the things he described have been HANDLED! Our priority is protecting our sovereign borders from invaders. And what Obama disclosed unwittingly (of course!) is that so are Democrats. He’s warning Democrats to not get caught up in Trump Svengali-like trance, and start focusing on the real issues. Forget the adoring crowd of hundreds at this rally. Obama spoke of the millions of Democrats who have walked away because they are tired of the lies of Democrats. They promise everything, and deliver nothing. Sadly for Democrats, not even the teleprompter could help Obama.